For many problems in life, it is helpful to have a visual component in order to better understand the situation at hand. People in all different situations and circumstances have long been using drawings and diagrams to lay out all of the relevant information in front of them before making a decision. It is the same way in business. Context diagrams are a great way to highlight all of the various inputs and outputs within a business (or part of a business) to then make decisions with. Companies that fail to use context diagrams may end up having a hard time understanding how one part of their business affects another, and what long-term effects their decisions could have. The beauty of a context diagram is that it can be applied to any business or organization equally. It will be up to you do create the diagram itself, of course, but the thinking and methods behind it are universally applicable. Once you understand how a context diagram works, and the basic manner in which you make one, you will likely find that there are far more uses for this tool than you once thought. Each of these parts is crucial to the overall diagram and the usefulness that it will have for the company. Keep in mind that a context diagram traditionally takes a broad-scope overview of the organization and its operations, and generally doesn’t get into the technical details of each process. Let’s take a closer look at each of the three parts that come together to create a context diagram. As you would be inclined to guess, a process is an activity that takes place within the organization or business. This can really be any activity, so long as it is internal and predefined. The predefined notion is important in this case as well – the process should not be something that is up in the air or speculative. It should be an established operation that is known within the organization and is predictable. Processes are really the basis for everything else that goes on within the organization. Most likely, you already have many processes that are defined and ongoing within the company. For this purpose, you are going to be looking at the high level process rather than the details that might take place behind the scenes. For example, a process within your context diagram could related to checking inventory for the availability of a given product or material. On the diagram itself, it would not be necessary to go into the specific steps that have to take place when you perform this task – the process is already established and defines itself sufficiently. If necessary, a lower level diagram could do the job of outlining the mechanics that go in to a specific process. Obviously, an external entity is going to be something that exists outside the scope of your organization. This is really where the diagram starts to take shape and take on value, because it helps you to see how what you are doing within your business can interface with what goes on around you. Working together successfully with external entities is essential for almost any business to succeed in the long run. There are almost countless possibilities when it comes to what an external entity might look like for your organization. It could be a supplier of materials, a payment processor, a group of clients, or many other options. The important part is that you understand how this external entity works together with your internal processes to create a work flow that is repeatable and reliable. Basically, the data flow is the connection between your processes and your external entities. Getting these two to work together is what the context diagram is all about. When any transaction takes place, data flows in one direction or another – and the data flows within your diagram capture that movement. If the data is flowing in the wrong direction, or not getting to the people who need it, that problem will make itself clean on the diagram. When your data flows are working properly, everything should be in tune between the external entities that you are working with and the processes within your organization. 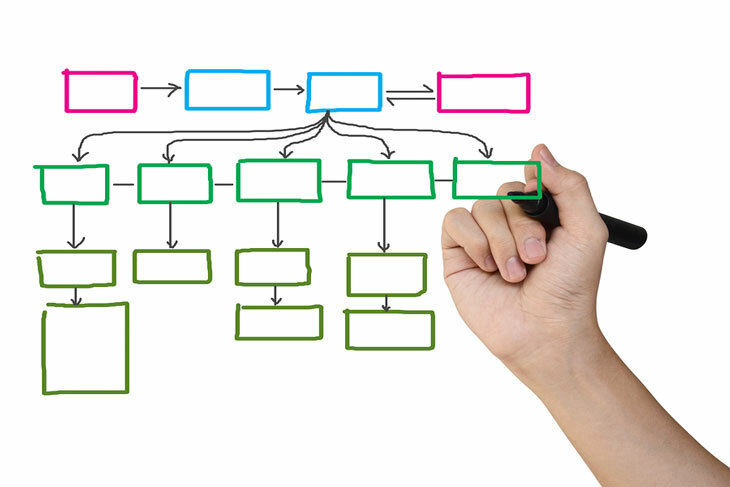 So should you take the time to create context diagrams for your organization? The answer to that question is almost certainly yes. While you might think that you have a clear handle on what is going on and how it relates to the various external entities that you work with, the reality is probably much more complicated than what you have in your mind. Getting these relationships down on paper into a diagram form will make it far easier to make improvements to your system along the way. If you have no way of visualizing the overall flow of your organization from a high-level perspective, you have very little chance of making it better. Another reason that context diagrams are so important is they provide the ability to integrate new people into your organization much quicker. It might be hard to explain verbally how everything works – and how one process relates to another – but a diagram can do the job in a short period of time. New employees within the company should be able to get ‘up to speed’ on the layout of the business simply by reviewing all the diagrams that you have created. Context diagrams are flexible, easy to create, and endlessly useful. One you get into the habit of maintaining them for your organization, you will likely wish you had done so sooner. There is no need to try to keep a clear understanding of the whole organization inside your head when you can get it down on paper and see it for yourself. Try making a context diagram sometime soon and see what benefits it might have to offer. The Context Diagram shows the system under consideration as a single high-level process and then shows the relationship that the system has with other external entities (systems, organizational groups, external data stores, etc.). They show the scope and boundaries of a system at a glance including the other systems that interface with it. They are easy to draw and amend due to its limited notation and no technical knowledge is assumed or required to understand them. They can benefit a wide audience including stakeholders, business analyst, data analysts, developers.